What a journey its been getting to Maine…celebrating with my family and friends at dinner! Check out the Pilot Episode of Mumbai to Maine! Mumbai to Maine – (my third child), was born right here in this kitchen, at this very kitchen table. My hubby, Guy, pictured above, is my BIGGEST cheerleader, my BEST friend and the LOVE of my life! It took Guy almost three years to build this beautiful kitchen for me. No detail was overlooked, every appliance I could wish for was thoughtfully purchased and carefully built in to ensure efficient workflow without compromising any aesthetics. Guy called this labor of love – his Taj Mahal for his wife, Cherie (his Mumtaz)! Only in this case there were only a few hands that did all the work, not 20,000 laborers. He knew I loved to cook and to be candid I’m sure he was tired of hearing me talk about food. One day he surprised me with a book on food photography and said, “For heaven’s sake please stop talking about food and now go blog about it!” The kitchen would have been enough to keep me busy for a long time experimenting with Indian inspired dishes. But Guy just knew that would not be enough for his wife. When I left Mumbai 23 years ago, I never imagined in my wildest dreams that Boothbay, Maine would one day be my home, my happy place, my creative muse. I knew I had to find a portal to share my passion for Mumbai and Indian cuisine and tie it into my deep love for my new hometown -– Boothbay and Maine’s dynamic food scene. Flash forward a couple of years, in the midst of what felt like the longest winter ever, between loads of laundry on a quiet Sunday afternoon, I felt this wave of inspiration come over me. I took out my laptop and sat down at my kitchen table and outlined what would become Mumbai to Maine’s six-part tv series. I listened to my intuition and knew that I would only produce this series if I could collaborate with two incredibly talented filmmakers – Ryan Leighton, of Walking Home fame and Cody Mitchell, renowned cinematographer and BRTV Media Center’s station manager. Before I could talk myself out of it, I composed an email to them both and hit send. I went back to folding laundry relieved that I reached out and didn’t chicken out. Within minutes I heard from them both – they were on board. My happy place, my Mumbai to Maine incubator, my kitchen. Both Ryan and Cody were born and raised in the coastal Boothbay Harbor Region. Ryan Leighton, directing Cody Mitchell for a scene. The incredibly talented Kim Martin, co-owner of Eventide Epicurean Specialties store in Boothbay Harbor, Maine showing me how to make Naan! I’ve always been a big fan of Ryan’s award-winning work as a news reporter for the local newspaper, the Boothbay Register, and his award-winning documentary, Walking Home. (We once found ourselves in an html coding class together – how random is that?) Ryan is an exceptional storyteller. He just knows how to curate a richly layered narrative and I knew he would know how to bring out the best in me on paper and on the screen. I was lucky enough to catch him at the right time as he was in between projects. Ryan was intrigued by Mumbai to Maine because it gave him an opportunity to delve into a creative blend of culinary and documentary narrative on screen. Cody is a formidable cinematographer, a sensitive and deeply thoughtful human being. A true artist. I am convinced Cody screens the world around him like no one else does. I knew this series needed someone with Cody’s creative eye and who would approach it with a unique perspective – one of a native, a local artist with a cinematic lens for a brush. So many of us are guilty of not being able to appreciate the simple beauty in the chaos of our daily lives. Cody has a way of capturing all the intangibles. His captures are cinematic gold and take my breath away. Just take a look at the Boothbay Region promo shot by Cody and directed by Ryan. Guy, my hubby, produced an original score for the promo! Cody capturing a dock sunrise -March, 2018. I had a cup of chai in my hand; he had a 40 pound camera. And yet a smile on his face. My dock. My sunrise. My Maine. I can’t wait for this pilot to air on December 11, 2018, in the very town it was created in. Here we are in the winter of 2018 working hard in post-production to produce a meaningful cinematic story that we hope will be embraced by a local and international audience. Driven by a love for culinary arts and “foodie culture,” the first season of Mumbai to Maine consists of 6 episodes; each taking a different narrative approach that highlights the characters and culture inherent to life here in Maine. What surfaces is a beautiful cinematic journey that seeks to connect us by our relationships through the people and places we call home. I hope you are captivated by it and feel inspired to perhaps one day share your story! Kim Martin sharing her story on how she and her partner Denise Demeter decided to launch their dream store in Boothbay Harbor, Maine: Eventide Epicurean Specialties. If you would like to attend the screening, check out this link to purchase tickets. We would love to see you there! If you can’t join us, Mumbai to Maine will be available on demand via Roku, Apple TV, and the BRTV website boothbaytv.com. Almost a year ago to date, during a long deep dark winter in Maine, while I was watching my newborn son sleep peacefully I felt this urge to get back into my kitchen and make a rich warm Indian curry to nourish my fatigued body and wake up my senses after being buried in a nursing fog. I knew I couldn’t get too adventurous and tackle one from scratch as my baby only took cat naps and Indian food requires patience, time and a slew of spices. In an impulsive move, I decided to reach out to Maya Kaimal founder of Maya Kaimal foods and let her know I was a big fan of her writing and was intrigued with her line of jarred curries. Maya responded almost immediately and within a couple of days her team had sent me the entire line of shelf-stable jars of sauces to play with in my kitchen. Back in college, I can remember buying a jar of Indian curry and feeling totally let down and even more nostalgic for my mother’s cooking. I figured no one could possibly transport a homemade curry with all its complex flavors into a glass jar. And then flash forward a decade, Maya Kaimal came along and accomplished the improbable: a line of signature Indian sauces that authentically reflect the subtle but discernable unique characteristics between the north, south, east and west regions of India. In the interest of time, I decided to review three sauces from the line: Goan Coconut, Kashmiri Curry and the Butter Masala. With my Portuguese-Indian (Goan) heritage running through my veins I knew I had to first give the Goan Coconut curry a try. So what is a Goan coconut curry? A quick history lesson would note that the Portuguese attempted multiple voyages to India and finally sailed into Goa, a coastal state located on the Western Coast of India, in the late 1400s and colonized it until 1975. Spreading Christianity, “combating Islam,” and strengthening their Portuguese-Asian spice empire were the primary goals of the Portuguese. The Portuguese finally overthrew the Arabs and took over the spice trade routes through Cochin and Goa. General Afonso De Albuquerque encouraged the Portuguese soldiers to marry the local women and thereby ensured Portuguese presence among the locals. While the Portuguese enjoyed a monopoly over spice routes they also introduced the fiery red chili pepper to the locals. What makes Maya’s curry uniquely Goan is the addition of coconut cream to tame and balance out the fiery red chilis. Goa is located on the west coast of India and its gorgeous coastline is dotted with groves of coconut trees. The locals use every part of the coconut. I vividly recall my mother taking the time to squeeze freshly grated coconut in a cheesecloth instead of using a can of coconut cream or milk. She would do it exactly three times: once to get coconut cream, then twice more for its milk. Luckily for me I didn’t have to add any coconut cream as this jar was chock-full of sumptuous notes of coconut that balanced out the tangy tamarind and the spicy chilis. What I did decide to add was a pot of hot water on the stove and made up a batch of fluffy aromatic basmati rice to go along with it. This mouthwatering dish was on the table in less than 15 minutes. Not only did I feel like a chef, but it also brought back memories of our Sunday suppers when my mother would make up an oversized pot of her lip-smacking shrimp coconut curry for her little girl. Infused with heady notes of cumin, coriander, cardamom, clove and cinnamon ( what I refer to as The Holy Grail of Indian spices, the 5 c’s ) and finished with a luscious buttery tomato gravy this Butter Masala transported me back to a grand wedding I once attended back in Mumbai. For added decadence I laced it with even more clarified butter. I decided to play around with this dish and added an extra step . I marinated the boneless chicken in some yogurt with a puree of ginger, garlic, a generous squeeze of lemon juice with finely chopped cilantro. After an hour, I took it out of the fridge and added some clarified butter ( ghee) to my dutch oven and sautéed the chicken with the marinade for about 15 minutes and then added the jarred sauce. Puree of garlic, ginger and yogurt with lemon juice and finely chopped cilantro. Maya’s Butter Masala was supremely delicious. I knew it as soon as I opened the jar and snagged a quick taste. I really didn’t need to add the extra step of marinating the chicken. But the comfort of knowing that the sauce was ultimately spot on with its flavor profile inspired me to add my own personal touches. Kashmir is located just below the Himalayas in India’s northern most tip. As a young girl living in the hot, crowded city of Mumbai, I have always held a quiet fascination for Kashmir. I recall my mom telling me stories about Kashmir – that it was hotly contested and fought over by both India and Pakistan. And yet, this war-torn state was one of the most beautiful places on earth with some of the best scenery, incredible food and warm-hearted people. My mother would regal me with stories about its rich cuisine. Kashmiri chilis are long, skinny and have a wrinkled exterior. But when ground into a fine powder – the chili powder instantly adds a vibrant fire-engine red color to any Indian dish without bringing too much heat. Maya embues her version of Kashmiri curry with notes of nutmeg, pungent mace and coconut milk to balance out the Kashmiri chili-infused tomato puree. My husband loves any Indian dish with lamb in it. I took the liberty of marinating cubes of lean lamb in yogurt, lemon juice, garlic and ginger paste for an hour in the fridge while I was on my lunch hour. I came home later that evening and let the cubes of lamb gently sizzle in some ghee and then simmer alongside hearty chunks of Yukon gold potatoes in this aromatic sauce. In less than 25 minutes, the cubes of lamb were fork-tender and the potatoes creamy and perfectly stewed. I cheated and bought some naan (Indian flatbread) and heated them up over a live flame with a pair of tongs and then lightly doused each naan with a garlic-infused clarified butter. Maya Kaimal’s line of shelf-stable sauces have now earned a front-and-center spot in my highly-selective pantry. In fact I have even started gifting them to friends who are intrigued with Indian food and are tad bit intimidated to make an Indian dish from scratch. With each jar of Goan Coconut Curry, Kashmiri Curry and the Butter Masala I felt transported back to my homeland of India. I have already started dreaming about my next adventure in my kitchen. Perhaps a cumin-spiked potato and pea deep fried samosa with Maya Kaimal’s Spicy Ketchup for dipping. Stay tuned for my next post! I was only 6 when I tried my first pork vindaloo. I will never forget that first bite: the tart but tender pork made my mouth pucker as my eyes widened in pleasant surprise. It was truly the first culinary roller coaster ride in my mouth. I had to have more! As a little girl, I thought of vindaloo as a grown-up dish. The flavors were intense. I never questioned what went in it to make it so delicious. I just ate multiple helpings of it as my mother recalls. But over the years, I’ve developed a curiosity about its origins and what gave this signature Indo-Portuguese dish a special spot in my mother’s culinary repertoire. A quick history lesson would note that the adventurous and ambitious Portuguese attempted multiple voyages to India and finally sailed into Goa, a coastal state located on the Western Coast of India, in the late 1400s and colonized it until 1975. Spreading Christianity, “combating Islam,” and strengthening their Portuguese-Asian spice empire were the primary goals of the Portuguese. Since the 12th century AD the Arabs had controlled all the spice trade routes into India. Eventually, after over a decade of battles the Portuguese finally overthrew the Arabs and took over the spice trade routes through Cochin and Goa. General Afonso De Albuquerque encouraged the Portuguese soldiers to marry the local women and thereby ensured Portuguese presence among the locals. While the Portuguese enjoyed a monopoly over spice routes they also introduced the fiery red chili pepper. The Goa vindaloo was derived from the Portuguese dish, Carne de Vinha D’alhos: a meat (carne) dish that was marinated in wine (vinha) and garlic. Since wine was not commonplace in Goa, the locals tapped into the abundant coconut trees that dotted the coastline and used the coconut tree sap to make palm vinegar. The local vinegar, commonly known as coconut toddy, replaced the wine in the marinade. Thus, the Goa vindaloo took on a life of its own and evolved into a fiery-red, spicy, vinegar-based stewed pork dish. The dish became uniquely Goan and no longer authentically Portuguese. I have tried the spicier versions of vindaloo, which are so high on the heat index that they fail to deliver the layered complexities of this Goan dish. 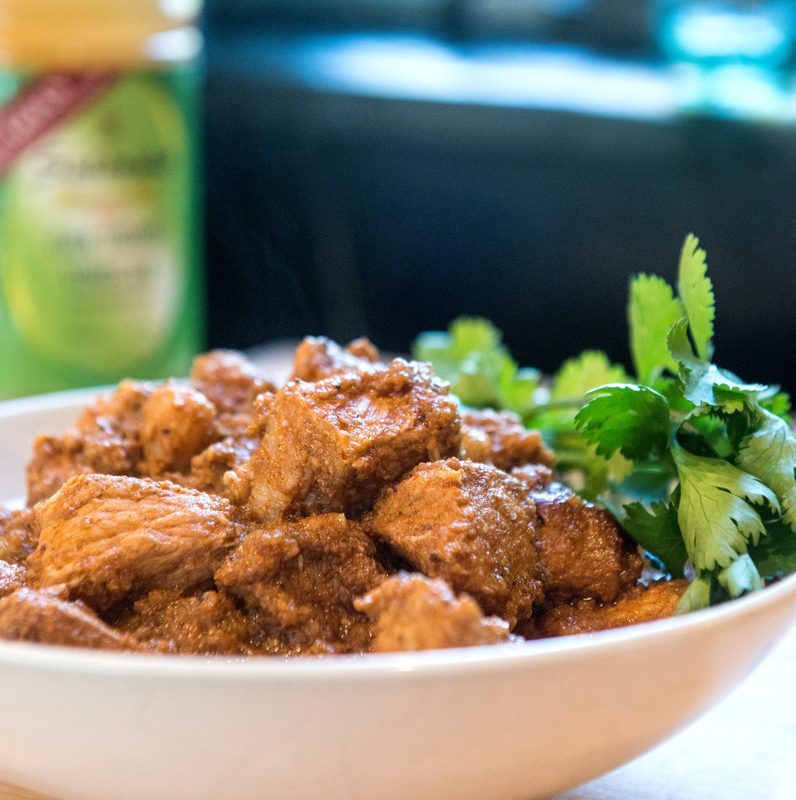 But then there is vindaloo that leave you aching for just another bite; vindaloo that doesn’t sear your tongue upon impact, but is slow-cooked and seasoned to perfection– leaving you wanting more. With an artful vindaloo you want to aim for tangy, tart, sweet, spicy, melt-in-your mouth pork with a fatty exterior and a lean interior. I was fortunate to have a tried-but-true recipe handed down to me by my dear mother, who has spent much of her adult life trying to master this nuanced dish. My mother’s eyes always glistened with nostalgia as she shared stories about her childhood summers in the village of Candolim, Goa. Every pig harvest was crucial for survival in this small village. The men would slaughter and carefully butcher the pig, while the women would take care of the cleaning, marinating, curing and pickling process. Everyone in the family would share a part in the harvest, the cooking and of course the feasting. Refrigeration was not an option and so locals had to pickle the meat in barrels with chili, garlic and palm vinegar. Another option was to cure the harvested and pickled meat in the intense summer heat and then resurrect the sun-dried meat with an addition of chilies and vinegar or coconut milk. Vindaloo was an important part of the Goan family unit. It was proudly served at every big Catholic holiday as in Easter, Christmas Day and special family occasions. The flavor profiles in this dish called for a sophisticated palette. This was my first attempt at a Goa vindaloo. It had to be authentic in every way possible. I was determined to source the Goa coconut vinegar online, and set my sights on the finest pork on the market: Berkshire pork from D’Artagnan, sourced from a co-operative of sustainable pig farmers at the base of the Ozark mountains. I took one glance at this tender, prime pork, intricately marbled with just the right layers of fat and my face lit up in delight. For the seasoning I imported a bag of whole dried Kashmiri chilies from an online vendor. You can also purchase Kashmiri chili powder. I chose the whole chilies and soaked them for a couple of hours in the vinegar until every chili slowly re-hydrated itself — plump and bursting with the unctuous vinegar flavor. 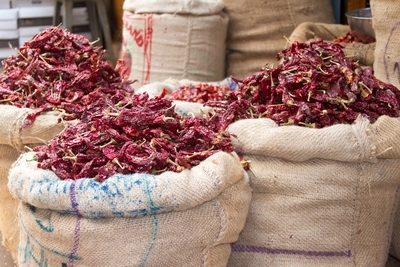 It is important to note the value in sourcing the right chilies – the Kashmiri chili is known for its signature fire-engine red color, a signature pepper of choice for Goa vindaloo. If you cannot source these chilies you can always substitute with a red chili powder and add paprika to add the red color. I ground the drunken chilies and the cloves of fresh garlic into a wet paste and rubbed the pungent potion into the two-inch cubes of pork. The piercing smell of the coconut vinegar and garlic took me right back to my mother’s kitchen. I took out my spice grinder and carefully measured the whole spices, as per the recipe. My mother always did her best to source whole spices, and suggested that I grind them right before adding them to the pork. Her sage advice was to lightly toast them in a pan before grinding, as her recipe below explains. I knew the complex flavors of the toasted cumin, cloves, cinnamon, cardamom and peppercorns would balance out the robust vinegar, chili, garlic and onion base. After a good forty-five minutes into the cooking, I weakened at the knees and gave in: I opened my Creuset and shamelessly stole a good chunk of the melt-in-my mouth pork – the luscious gravy dripping down my chin and apron. In that private moment, time stood still, and I felt like I was 6 all over again, longing for one more bite. Only this time around I was at my own kitchen counter with my daughter asking for her first bite of her mommy’s special pork vindaloo. 1. 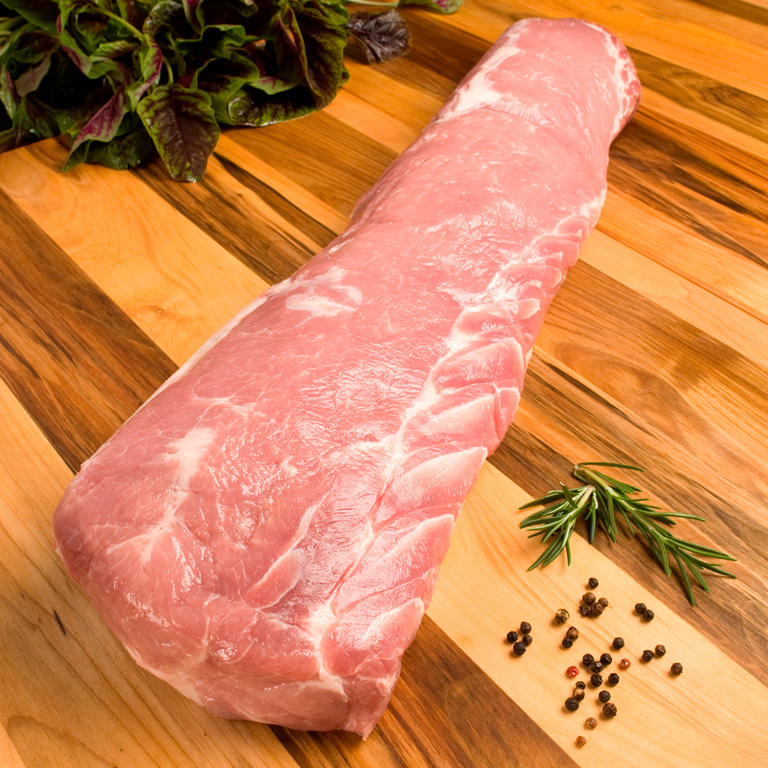 Cut Berkshire pork into 2 inch pieces, salt, and set aside in a big glass bowl in the fridge, covered. 2. Soak 12 whole Kashmiri dry chilies in a 1/2 cup palm vinegar or Goa coconut toddy for two hours until re-hydrated. 3. Toast the following spices in a pan on low heat for 1 minute. Allow to cool. 4. In a food processor grind 1 yellow onion ( roughly chopped) and 5 flakes of garlic with the soaked Kashmiri chilies and the toasted spices into a thick wet paste or marinade. 5. Pull out the cubed pork from the fridge, rub the marinade into the pork gently, cover with plastic wrap and set aside in the fridge overnight. The next day, take the pork out of the fridge and allow it to come to room temperature. 6. In the meantime, make the gravy: Put 1/2 cup of vegetable oil in a heavy bottom pot, medium heat. Add 1 medium-sized finely-sliced yellow onion, sliced ginger, 3 flakes of diced garlic, 2 green chilies. Fry on medium-high heat, until soft, with lid on. Stir occasionally, don’t let this burn. 7. Add the marinated pork pieces with left over marinade, fry well for 10 minutes, turning often in oil. 8. Add 2 cups of boiling water and stir. Cover and cook on a slow to medium heat without burning at the bottom. 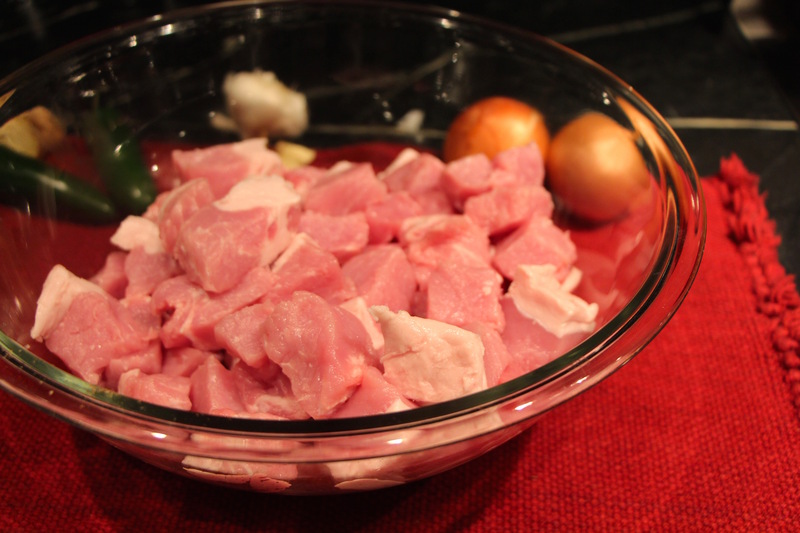 Stir every 15 minutes until the meat is tender and skin of pork is soft and well done. I dare you to not steal a piece of the tangy pork. Allow the pork to cool and then refrigerate. Heat again and add 1/2 cup of chopped cilantro. This dish always tastes better the next day, so make it ahead of time and then reheat before company arrives. 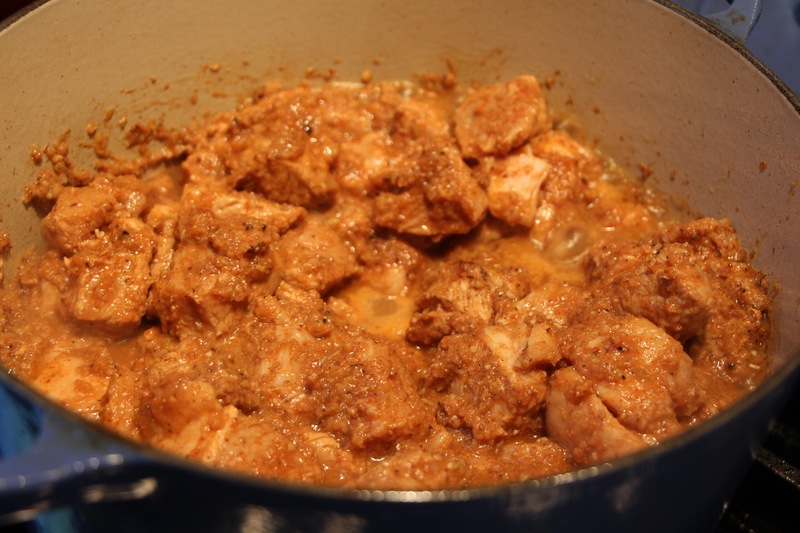 Butter Chicken – the creamier the better! I knew I was in trouble. Typically, for this dish, I would make sure I had all the ingredients prepped and marinated in the fridge overnight for best results. But I just couldn’t say no to my little girl. I mean, how often does a 7-year-old ask for Butter Chicken for dinner? I could come home and prep it all on my lunch break, I thought silently as I stared at those innocent brown eyes in my rearview mirror. I was going to make it happen, somehow. All I needed was a pair of wings and my magic wand today!!! I had a packed day: meetings and more meetings. But I was determined to sneak out for a bit. I drove home and ran into my kitchen. My husband, who works from home, thought I was a little crazy as I ran past him in my heels muttering something about chicken, but I didn’t have time to defend myself. I guess when it comes to my daughter’s love for Indian food, I do go a bit overboard and over compensate. In true Rachel Ray fashion, I grabbed every ingredient in both hands and kicked the fridge door shut with my left stiletto, my pearls dangling in between the yogurt and the cilantro. I tossed the pieces of dark chicken meat into the yogurt and the spices, squeezing the life out of my one life-saving lime. I gave it all a good stir and wrapped it up with cling wrap in a glass bowl. Back in the fridge it went and out the door I flew, back to work, as my belly rumbled reminding me that I just won the award for the best and hungriest mother on the planet. I comforted myself knowing that the secret to Indian food is not in the cooking, but in the prep. If you can let the spices, the citrus and yogurt break down the meat and season it, you’ve scored. That evening, I quickly diced the onions and sautéed them in butter. I typically use ghee, but I had run out that afternoon. I tossed in the marinated chicken, the tomato sauce and covered it on low heat for 40 minutes, resisting the urge to peek. While it simmered softly, I soaked my Basmati rice and proceeded to make a fluffy bowl of it to go with the rich gravy. Mix the yogurt, spices and lime juice together in a large glass bowl. Add the chicken pieces and coat with the marinade. Cover with plastic, refrigerate and let the meat marinate for at least 2 hours or overnight. 2 – 15 oz cans of tomato sauce or puree, no spices added. 1 cup of heavy cream, light cream or Half ‘ n Half can also be substituted! Remove the marinated chicken from the refrigerator and let it reach room temperature, about an hour. In a 3-quart oven-proof pot or Dutch oven, sauté the yellow onions in the ghee for 5 minutes on medium-high heat until golden brown. 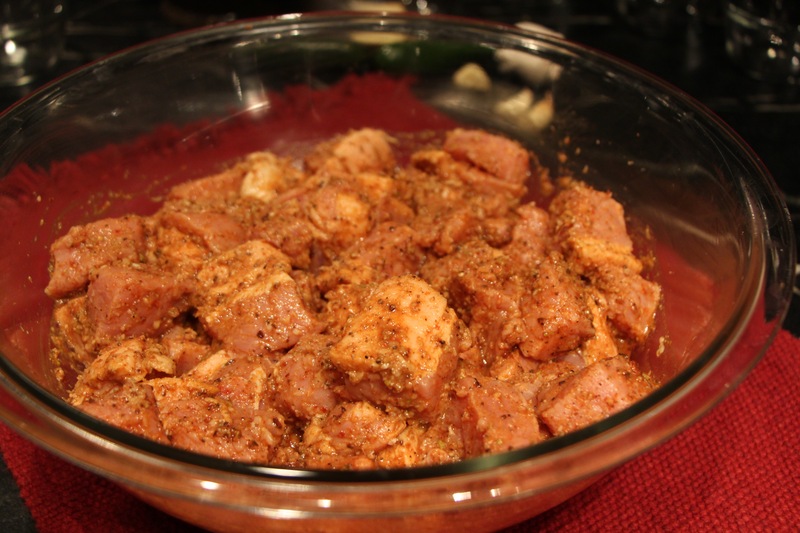 Add the marinated chicken with the left-over marinade and cook until the chicken changes color, about 10 minutes. Add the tomato sauce and allow it to cook on medium heat for another 5 minutes. Cover the pot, reduce to a low simmer until the chicken is cooked, approximately 40 minutes. Resist the urge to peek! Now give it a good stir, add the Half ‘n Half and chopped cilantro and let it simmer for another 5 minutes. Serve warm over Basmati Rice with Naan and or Papadums for a side. Thank you Ted Axelrod for these stunning pictures! Bring to a slight boil, turn down heat and simmer. Keep scraping down the sides of the pot and stirring the cream that assembles on top of the milk back into the milk. You must keep stirring and never allow it to come to burn at the bottom or sides of the pot. Stir in the almond meal with the crushed pistachios. Allow to simmer for another 5 minutes and thicken. Turn off the heat. Take the pot off the stove top; pour the mixture into a glass bowl and allow it to cool down completely. Cover the dish with plastic wrap and place in the freezer. Every twenty minutes stir up the ice-cream with the fork and break up the ice crystals that will form inevitably. As soon as the mixture begins to freeze up, scoop and place it into moulds and freeze tightly. Before serving, place into a hot water bath and slip out of moulds onto a pretty plate and garnish with chopped pistachios and couple of saffron strands. Or you can place the room-temperature mixture into an ice cream machine (I borrowed a friend’s Breville ice cream machine) and allow it to churn for an hour. It will stay cool in the machine for 3 hours after its done. After dinner, pull out some chilled martini glasses, and scoop the ice-cream into the glasses; garnish with a couple of saffron threads and crushed pistachios. I started this recipe at 10pm. and didn’t realize that it would take an hour and half for the milk to reduce to ⅓ of the original amount. After I was done reducing the milk and took it off the stove and put it into the freezer at 11:30p.m. I decided to take a short nap that transitioned into a deep slumber until I got woken up by a phone call at 8 a.m. I ran downstairs to my freezer and much to my dismay the entire mixture was frozen and full of ice crystals. I panicked and called a friend who told me to keep stirring it vigorously with fork. To my surprise I was able to bring it back to the consistency and room temperature it should have been before I put it into the freezer the night before. I then drove over to her house and borrowed her miraculous Breville Ice cream machine. I poured it into the machine and turned it on. Voila! I had Kulfi! There were a few ice crystals but minimal. it tasted delicious though! Don’t take cat naps when making Kulfi. Don’t start Kulfi ice-cream at 10p.m. Buy an ice-cream machine. It’s not necessary but worth it. It saved my dessert. This dish is a true labor of love and brings back a flood of memories. Mom slaved over it for days and fed close to 40 people at each of our family celebrations back in Mumbai. Biryanis date back to the 1600’s when Mughal emperors entertained and feasted on it.This signature dish cannot be thrown together in a rush. It demands love; patience; attention to detail and a bit of planning ahead. But when you take your first morsel of saffron-kissed rice and melt-in-your-mouth Indian-spiced lamb be prepared for a symphony of flavor to explode in your mouth. Open a bottle of your best wine: this lamb feast is fit for a king and calls for nothing less than a celebration! Mix the yogurt, spices and lime juice together in a large glass bowl. Add the lamb pieces and coat with the marinade. Cover with plastic, refrigerate and let the meat marinate for at least 1 hour or overnight. Remove the marinated lamb from the refrigerator and let it reach room temperature, about 2 hours. Add 2 more tablespoons ghee to the now empty skillet and pan-sear the potatoes on one side on medium high heat about 5 minutes, until they are crispy brown. Turn the potatoes over, cover the pan and let the potatoes steam another 5 minutes; set aside. In a 3-quart oven-proof pot or Dutch oven, sauté the yellow onions in the remaining 2 tablespoons ghee for 5 minutes on medium-high heat. Add the tomatoes and fry for another 5 minutes. Add the marinated lamb and cook until it changes color, about 10 minutes. Add 3 cups hot water, the cilantro and the reserved lamb bone. Cover the pot and simmer on low on the stove top until the lamb is tender, approximately 11/2 hours. Resist the urge to peek! After 11/2 hours, add the reserved pan-seared potatoes and 1 cup of the reserved caramelized onions to the pot to thicken the gravy. Re-cover the pot and simmer for another 25 minutes. While the lamb is simmering, soak the rice in 3 cups of water for 25 minutes. Run your fingers through the grains to help remove the starch; do this gently so the grains don’t break. Strain through a fine-meshed sieve. Fill a large pot with 15 cups water and the salt. Add the cinnamon, cloves, cardamom, cumin and bay leaves. Bring the spiced water to a roiling boil. Gently add the basmati rice. Boil the rice until it is three-quarters of the way cooked. Keep an eye on it and check a couple of grains after 5 minutes to make sure it is parboiled and not overcooked. The grains of rice should feel a bit starchy or gritty in the middle, as if they could crack in your hand. The rice will finish cooking in the oven with the lamb. Drain the rice, leaving in the whole spices. Pour the drained rice into the pot with the lamb. Add the food coloring. Warm the milk, add the saffron and stir gently. Let steep for a couple of minutes at the most. Pre-heat the oven to 335 degrees F.
Sprinkle 1/2 cup of the remaining caramelized onions over the pot with the lamb and rice. Save the remaining caramelized onions for garnish. Pour the warm milk mixture onto the lamb and rice in circles. Do not stir. Close the lid and bake the lamb for 35 minutes. Arrange the lamb biryani on a large platter. Garnish with the last ½ cup of caramelized onions, the eggs, cashews and a sprinkle each of cilantro and mint. To serve, dig a flat serving spoon into the rice, being sure to go to the bottom so you get meat, rice and potatoes in every portion. THANK YOU to my dear friend Ted Axelrod ( Ted Axelrod Photography) for this gorgeous image. Life is gentle in Maine. Maine has slowed me down. I’ve gotten used to it. I hate to admit it but I have come to enjoy the legato tempo of Maine life. But there are days when my heart pines for the chaos and bustle of the sardine-packed city of Mumbai – my original hometown. It doesn’t take much to take me back home. An occasional sniff of basmati rice as it steams on my stove is all it takes. In one of my food fantasies I wish I were devouring at least a half dozen spicy Indian street foods: Piping hot samosas bursting with green peas and cumin-scented mashed potatoes; coriander dusted lamb-sheek kabobs dripping with cayenne-spiked lime juice on slightly charred flatbread or a crisp lentil Indian crepe Masala Dosas with at least three coconut chutneys for dunking. But then I realize that those days are gone. I can no longer just take a walk down the rickshaw-lined streets of Mumbai and scarf down street foods to my heart’s content. The beautiful state of Maine is now my hometown. But the East Indian-city slicker has not checked out of Mumbai. So here I go again cooking up yet another batch of Indian treats right in my Maine kitchen. The nutty aroma of Basmati rice fills the Maine spring air. It’s almost ready for a warm lentil stew to coat those perfect grains. I lean against my warm stove with a cup of steaming chestnut-colored chai laced with spicy ginger chunks ,cardamom, clove and Malabar peppercorns. Wake up Cherie……you have arrived at your destination…..Mumbai IS now in Maine! Chick PeaFlour deep fried crackers with Turmeric-cumin infused Mashed potatoes, whole chick peas and spicy cilantro mint chutney with a dollop of ever- so slightly sweetened whole yogurt. Garnished with Chaat Masala and Spicy Sev. I used to enjoy this sweet-savory snack after school on the 2 mile walk home. I still love foods that crunch (ask my husband – it drives him nuts) layered with flavors of sweet, sour and spicy! Were these ever addictive and took me right back to my favorite street vendor on Hill Road, Bandra, Mumbai. Thank you Ted Axelrod Photography for the beautiful photography. If you’ve ever had the pleasure of brewing a strong cup of chai the entire process is as therapeutic as drinking the exotic beverage! My morning ritual begins with the hottest water in an oversized mug. (Bigger is always better.) I adore watching those black tea leaves get christened with the scalding water slowly staining my porcelain cup with its mahogany goodness. Embracing the mug in both hands, I take long deep breaths as the blend of crushed spices disperse among the black tea leaves and permeate one another. As the heat warms my hands and the steam hits my face I can almost picture a Mumbai chai-wallah (a street vendor who makes chai for a living) pouring the strong brew from one glass to another like a silting Himalayan waterfall. I get lost in the aromatic fog. The whiffs of chai give my sleepy face a cardamom facial while the chai cools down. On quiet mornings when I’m not hurrying out the door, making a cup of chai also brings back memories of my childhood in the city of Mumbai. Although chai has gained tremendous popularity in the West there is some confusion as to what chai is and how to refer to this spicy beverage. Chai is traditionally a hot beverage made with Assam or Nilgiri black tea leaves heavily infused with a variety of spices: cinnamon, cardamom, clove, star-anise, fennel, peppercorns, and ginger brewed in a blend of hot water and milk with added sweetener to one’s taste and preference. In Hindi, chai means “tea.” So if you ask for a cup of chai-tea, you are literally asking for a cup of tea-tea. You might get a confused look from your chai-wallah. In the southern part of India, masala chai is ubiquitous. “Masala” in Hindi means spices. So if you ask for a masala chai expect a potent version of chai: black tea brewed and blended with a powdered version of the spices. Masala chai is primarily made with whole milk, no water, in an attempt to mellow and balance out the robust spicy flavors. Recently, in a bout of nostalgia, on a frigid day in January, I made an entire crockpot of chai. I threw in a box of black tea bags into some hot water and left the heavy mulling ball bursting with cardamom pods, nutmeg, peppercorns, chunks of raw ginger, crushed cinnamon sticks and bits of clove. The ball sat there happily steeping in the dark brew for three days enhancing it with its Ayurvedic goodness. Just one good chug and it made my heart gallop like a Morgan Horse! Even I had to admit it needed a generous splash of cream. Back in Mumbai, chai was an intrinsic part of our daily lives, no matter how hot it got! One of my fondest memories as a young girl was surprising my dad with a perfect cup of tea as he got home from work. Barely old enough to stand by a stove, I would open the stainless steel can filled with Nilgiri tea leaves and dig right in to get an oversized heap. Gently, I’d add in the raw milk that was hand delivered promptly at 5a.m. Occasionally, a little bit of heavy cream would slide in…ah, creamy perfection! I knew dad loved that extra treat. I watched impatiently as it came to a boil. I would then throw in the tiniest stick of cinnamon, a couple of cardamom pods, cloves, peppercorns, and if I felt adventurous a big knob of ginger. I could always time my father and knew exactly what time he would walk in the door with his newspaper in hand. He was punctual to a fault and routine was his middle name. I didn’t need to ask him how his day went because with a cup of chai in his hand I knew life was good! His shoulders would relax as he took in his first whiff of his evening chai after a long day at work. I could sense the tension of his day melt away as he took his first slurp. It was always too hot to sip. Dad chose to slurp it instead. I can’t even talk about chai without reminiscing about our evening family-tea time back in Mumbai. Marie and Parle-G biscuits were a staple to go along with our tea. If we were out of our stash, I was charged with 5 rupees in hand to walk to the convenience store at the end of our street and pick up biscuits to go along with our chai. Now, I can’t walk past the ethnic aisle at our local grocery store without picking up at least a couple of packs of those golden-wrapped Marie biscuits. I’ve gotten my daughter hooked on them, too. She won’t ask for them every day, but on days when she needs some special mommy time she knows to come up to me and ask for chai and biscuits. She even dunks the biscuits into her chai the way I did. We sit quietly at the kitchen table and share a pack. Sometimes she over dunks and a few chunks fall in and she scoops them out. She might not know how to make chai from scratch or realize how trendy it has become these days, but she does know that with mommy by her side, chai and her favorite biscuits in hand, life is good! And so the chai drinking family tradition continues. All photos: Ted Axelrod Photography, of course! 6 *black tea bags or 12-13 grams of tea leaves. On a low flame, heat the milk or water until it’s almost to a boiling point, throw in the tea bags and all the spices and bring down to a stern simmer for 5 minutes. Keep the flame low at all times until end. Slowly bring to a boil again, when the milk rises to the top, turn it off. Strain in a colander or pull out spice ball. If you chose water as your base either drink it straight up with sugar, or add in a generous splash of Half ‘n Half or light cream at the end to cut the strong chai. *Assam, Kenyan, Nilgiri, Ceylon black tea eaves provide the strongest black tea blend. Try to avoid a Darjeeling blend - totally different flavor, English Breakfast Twinning (too acidic) Earl Grey (too weak). You can use Agave Nectar as a substitute. Agave is 1.5 x sweeter than sugar, so I use only 1 & a ½ teaspoons of Agave per 8 oz. of milk. Multiply the recipe based on how much you want to make. I usually make a gallon or 16 cups. Use water as the base, not milk. You can be more generous with your spices and add an extra tea bag or two to make it a strong batch. Cook on low for 4 hours. I pull out the tea bags and discard but keep the spices in the spice ball and let it steep at room temperature. At this time, if you’ve crushed the spices you can strain it. I ladle out as much as I need and heat it when I am ready to drink it with a generous splash of light cream or half ‘n half and sugar based on taste. Keep it in a large mason jar in the fridge or on your kitchen-counter in a Mason jar and use as much as you like. Chai’s Ayurvedic goodness permeates your kitchen!!! In the summer, it makes for great on-the-go-iced chai.